Last week, I made my first official appearance as Ms. Wheelchair USA in a very special way - at the Oakland for All's "Ramp Crawl" and celebration of the 28th anniversary of the Americans with Disabilities Act (ADA). Oakland for All is a community organization that I've been a part of for about a year now - they work to make Oakland more accessible and inclusive for all people, including those with disabilities. Because Pittsburgh is an old city, and is built into the hills, there are many buildings that are still inaccessible and have one (or more) steps to get in. 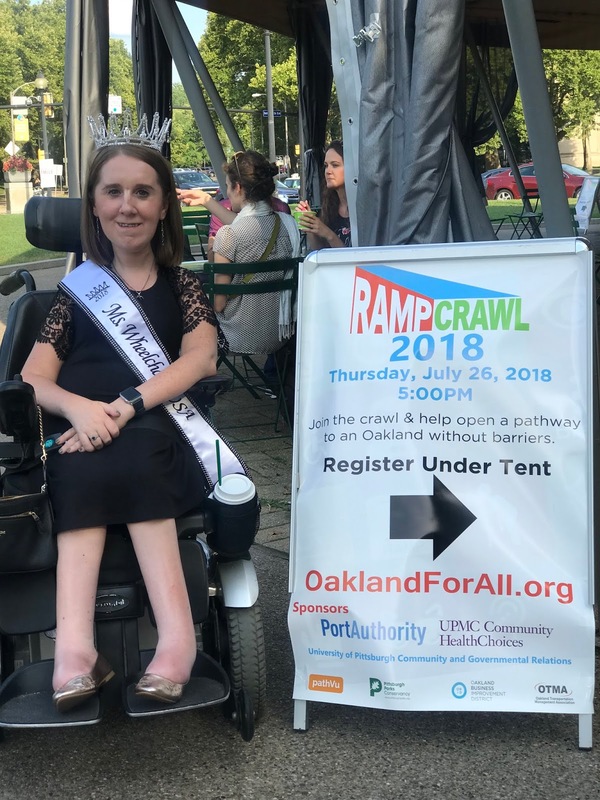 So the Ramp Crawl, a take on the traditional bar crawl, was designed as a way to highlight the places in Oakland that are already accessible. This year, the event highlighted one business owner in particular, who addressed his restaurant's inaccessibility by adding a ramp to allow wheelchair users access to his delicious sushi! The Ramp Crawl was held on the 28th anniversary of the ADA, making it extra meaningful. While the ADA was certainly landmark legislation and did a lot to impress access for people with disabilities, it's also clear that we still have work to do to improve accessibility. The fact that a Ramp Crawl needs to be held shows that buildings being accessible is still the exception and not the norm. The Ramp Crawl fell perfectly in line with what I'm hoping to do with my platform - increase inclusion and accessibility within the community. The Ramp Crawl shows that people with disabilities like to go out to eat and drink, just like everyone else, and brings attention to restaurants that are accessible to people with disabilities. It was the perfect opportunity for my first appearance, and I'm so glad that I could take part!